And now, a little something to cultivate your inner diva or rock star. Ready to lay down some tracks that’ll have Grammy voters take notice? We watched this year’s awards and wondered what it would be like to have a part in music’s biggest night. The fans! The clothes! The music! 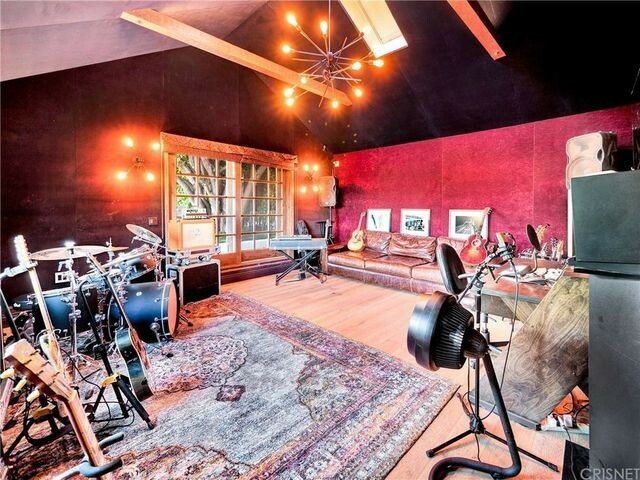 Well, to increase your odds of snagging a trophy in 2020, we’ve found five Los Angeles–area homes with recording studios. Sizes and styles vary, but they’re all on the market with prices ranging from $1.55 million to $4.65 million. There’s also a mansion in a celebrity enclave for rent at a sweet $36,500 per month. 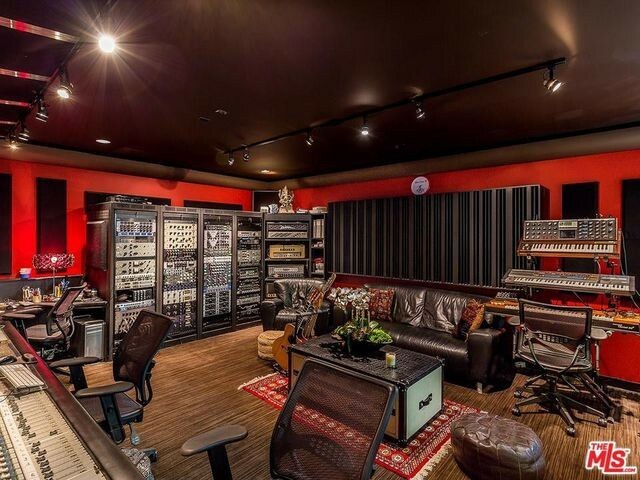 The glitziest of them all—the studio gracing the home of Motley Crue‘s Tommy Lee—even comes with Grammy vibes of its own. Award-winning artists including Aerosmith, Fleetwood Mac, and Smashing Pumpkins have all recorded in Lee’s studio. 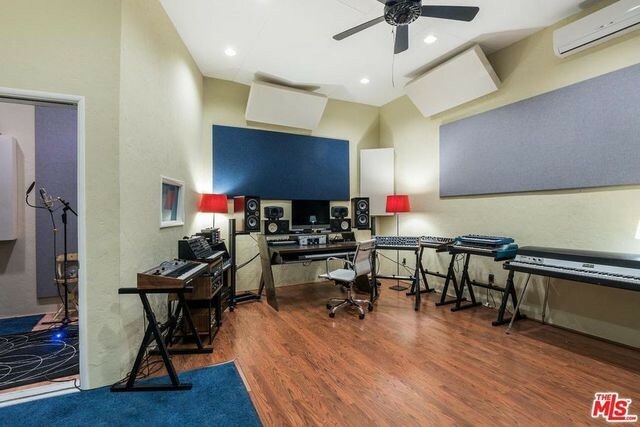 The studios we’ve found all come with varying amounts of equipment, and they’d be able to serve everyone from the hobbyist musician working on a dream to a serious pro with gold records already on the wall. 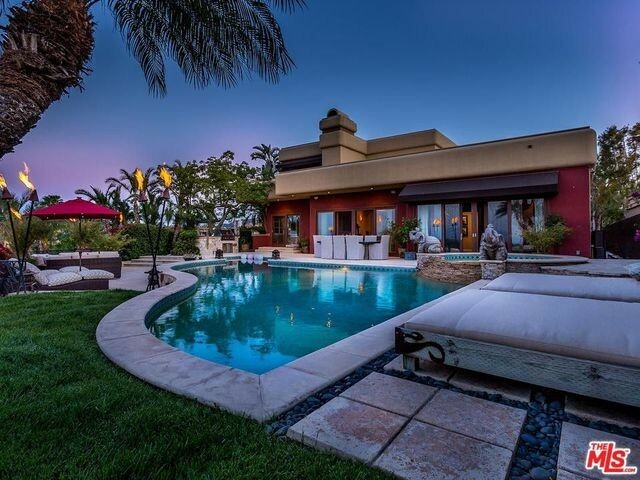 The score: Drummer Tommy Lee has tricked out almost every square inch of this six-bedroom home. It oozes a hard-hitting glam vibe you’d expect from the rock star. 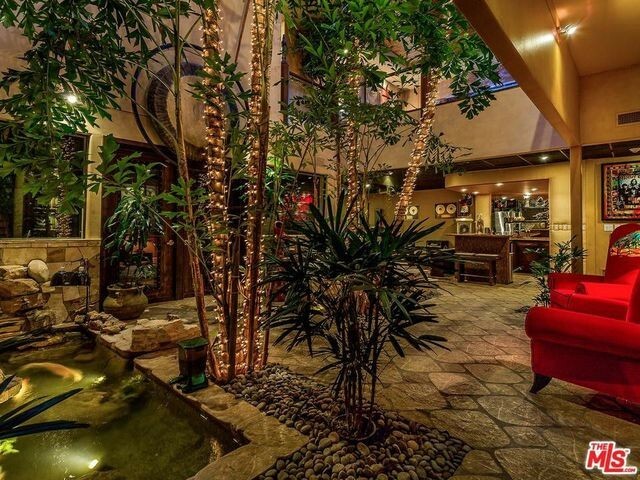 The entire lower level of the home is a “fantastic entertainment facility,” according to Compass’ Tomer Fridman, who is co-listing the 9,991-square-foot rock ‘n’ roll paradise with Jonathan Michael Sigfried. It includes a world-class recording studio with four separate booths and a huge control room. Right outside is a tropical club area with a bar, kitchenette, and atrium with a waterfall, stone spa, and koi pond. Musicians who need to clear their mind can take a Zen break in between recordings. For the entourage, there’s a plush home theater on the same level. When a session is done, take a dip in the home’s piano-shaped pool. Fridman says a seasoned musician would never have to leave home. Hit record, and let the glory follow! 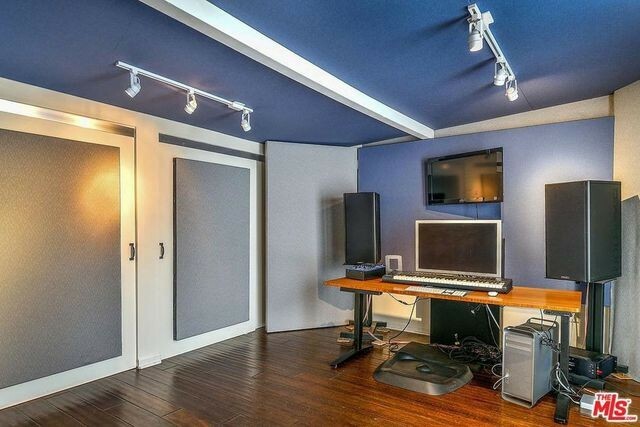 The score: While this 90210 recording studio is not as fancy as some on this list, the location in the gated community known as The Summit is certainly capable of providing inspiration. A number of music industry heavy hitters, including Britney Spears, Jennifer Lopez, and Gwen Stefani, have called the community home. 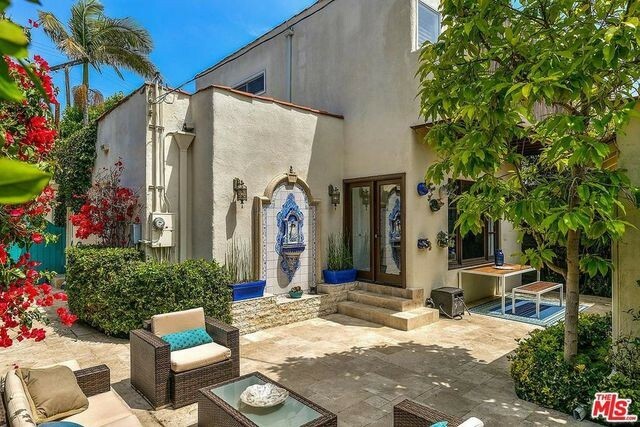 “It’s an exquisite Mediterranean estate, perfect for a recording industry executive,” says Fridman, who represents the listing. The six-bedroom, 5,622-square-foot home also features sprawling lawns, a pool and spa, and a cabana with kitchenette grill and bar. It’s the ideal spot to put on some tunes and throw a party. The score: Currently a working musician owns this hillside home, but it was also previously owned by Albert S. D’Agostino, the Oscar-winning art director for Alfred Hitchcock. Built in 1927, the home was recently renovated with top-of-the-line finishes. The spacious studio is separate from the four-bedroom home. If a buyer doesn’t happen to harbor Grammy dreams, the space can easily be converted to a man cave, gym, or yoga studio. The score: Create your own “Bohemian Rhapsody” in this Spanish-style beach cottage. There’s a cozy main house with arched windows, coved ceilings, and a fireplace. But we’re focused on the separate guesthouse that’s been upgraded and soundproofed for professional-quality recording. The property is quaint and private and features a charming courtyard with a tile fountain in the backyard. It’s all located within walking distance to restaurants, shops, and schools, and within biking distance to the beach. 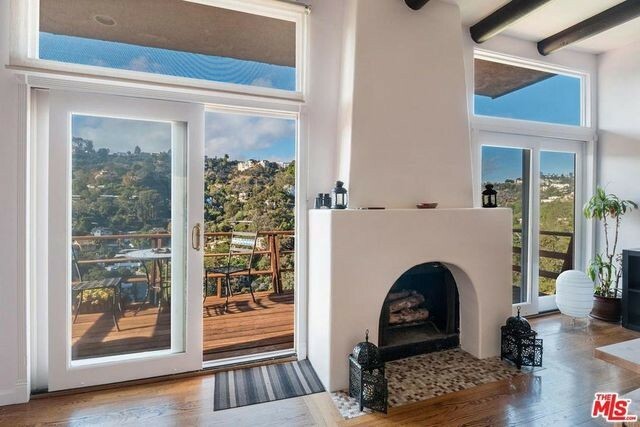 The score: Perched in the Hollywood Hills, this two-bedroom home is sure to provide plenty of artistic inspiration. The soundproof and acoustically treated recording studio with a separate entrance is the ideal place to let your creative juices flow. Located off Laurel Canyon, the home also offers easy access to the famed Chateau Marmont, and all of the rockin’ clubs on Sunset Boulevard.